So, check out that photo. This month, Hasbo’s Star Wars: The Black Series line has released several new action figures. They’re good stuff, let me tell you. High-quality action figures with collectors in mind. It’s just that two of this month’s figures…well, check them out. We got C-3PO and…C-3PO. No, you’re not reading that wrong. So, take a look at the photo and let’s play “spot the differences” like you’re 5 years old again and reading Highlights magazine, because those are two different figures. What do you see? Yeah. One of those is C-3P0 from The Force Awakens, where he’s got the red arm which he just had to show Han Solo, inadvertently cockblocking him after he’d been away from Leia for seven years. That was serious merchandising there, pulling a “new hat” on C-3PO by changing the color of one of his limbs so we’d know that we were in a different movie. We saw that arm for less that 5 minutes of screen time, I’m sure. He even got his old arm back by the end of the movie. 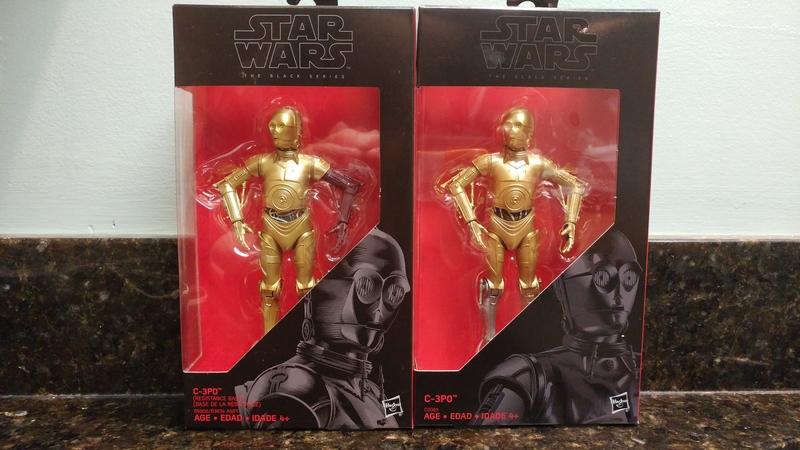 The other C-3PO figure is “classic” 3PO from the original movies. He’s got a gold arm and his silver leg. It’s the exact same figure, except with a color difference, and that’s it. Oh, and he’s a Walgreens exclusive, meaning that collectors have to raid the Walgreens in their towns and knock old ladies out of the way to get that one, oddball figure they have for some reason, because why else would nerds be in a Walgreens voluntarily? Alternative, it’s eBay for those of us who need to pay the markup to get the thing. This was a pretty crappy move by Hasbro, releasing the same figure twice with a minor cosmetic change. Star Wars: The Black Series figures aren’t exactly cheap, running at $20 retail. Making the “classic” version of the character–the one who was in the original three movies–adds an additional layer of dickishness to this whole thing. Retailer exclusives are cute, but they shouldn’t be a high-demand figure that’s going to hurt your toy lineup if you don’t have it. A Prototype Boba Fett figure makes a nice exclusive. A classic character does not. Hey, you know what’d solve this whole thing and save collectors $20 that they could spend on a different figure, or, you know, food? It’s real simple. Give 3PO an extra gold arm and leg that can be removed and replaced. Real easy. Hasbro does this all the time with their Marvel Legends figures with characters that have extra heads and hands so they can be modified as collectors desire. Don’t tell me that they can’t do that due to some kind of cost overrun. The Marvel Legends figures all come with a bonus chunk of plastic so we can make those “Build-a-Figure” things. Yeah, we’re all going to buy the toy, because we just love Anthony Daniels. But we’re mad, Hasbro. Buying a C-3PO toy for an arm and a leg shouldn’t cost us a…you know.